The year is just a little more than half over, but we’ve already seen an explosion of innovative tech. Here’s a look at the best of what is out so far in phones, tablets, HDTVs, cameras, and more. The year is only a bit more than half over, but so far 2012 has been an exciting year in terms of cool technology. We’ve seen the arrival of a new iPad, Microsoft’s entry into the tablet arena, the unveiling of a dazzling Sony gaming handheld, and other debuts. Here’s a roundup of some of the year’s best (so far) in cameras, smartphones, tablets, TVs, laptops, e-readers, and more. Let’s start with what may be the best point-and-shoot camera ever. Enjoy! Possibly “the best pocket camera of all time,” the Sony Cyber-shot DSC-RX100 surpasses even the Canon PowerShot S100, which until now was the best point-and-shoot camera you could find. The RX100 is groundbreaking mainly because of its sensor, which is much larger than those in other cameras of its size. The RX100 also has a very wide F1.8 aperture, which is optimal for capturing shots with a dramatically shallow depth of field, as well as for taking photos in low-light situations. The RX100 rocks in capturing video, too: It takes 1080p video at 60 frames per second, and provides manual shutter and aperture controls when recording. Billed as “the professional’s compact camera,” the Cyber-shot DSC-RX100 isn’t cheap; it’s available in stores and online at the Sony Online Store for $650. The Samsung Galaxy S III is one of the most hyped smartphones in recent memory. New features include tilt zooming (which is great for Web browsing), shake to update, and flip to mute (so you can easily ignore unwanted calls). You can also take a screenshot by swiping from right to left with the side of your hand, and–just as the commercials brag about–you can send email and text messages while watching an HD video. In her full review of this sleek and minimalistic phone, PCWorld Senior Editor Ginny Mies says it’s the next great Android phone in terms of design, display, and performance. All major carriers sell the S III. Hangouts, which let you video-chat with up to nine other people, are arguably the feature that Google+ users like the most about the social network. In addition to getting a group of friends or business associates together on screen, you can join Hangouts with strangers who share your hobbies or interests. And Hangouts got even better when Google+ revealed live Hangouts On Air in May. With this feature, you can broadcast the live Hangout video publicly from a Google+ stream or a YouTube channel, or embed it on a website. During the automatically recorded session, you can see how many people are watching. When you end the Hangout, Google uploads the recorded video to your YouTube channel, as well as on Google+. It’s great for musicians, business professionals, or anyone else who wants to try to make a message go viral. Additionally, the Google+ app for the iPad finally showed up in July, so the millions of people sporting Apple’s popular tablet can now get in on the Hangout action. Although Apple’s third-generation tablet looks like the iPad 2 on the outside, once you start it up you immediately see that this iPad leaves its predecessors (and competitors) in the dust thanks to its 2048-by-1536-pixel, 9.7-inch Retina display, which sets the standard for what users should now expect of their tablets. The latest iPad is the first tablet that we have tested to earn Superior marks in our subjective screen-quality evaluation. (Superior is our highest rating.) And the third-generation iPad’s 4G connectivity option makes it a tremendous step up from previous iterations of Apple’s massively popular tablet. Although the two tablets that Microsoft recently announced–the Surface RT and Surface Pro–are not yet on sale, there’s no question that Microsoft’s decision to build its own tablets changes the market considerably. For one thing, why buy a classic laptop if you can purchase a tablet that quickly and elegantly becomes one when you need it to be, without sacrificing performance, interoperability, or functionality? While it’s unclear how much market share Surface tablets will take away from sales of Apple’s iPad, the new Microsoft hardware certainly will make things tougher for tablets running Google’s Android operating system, which have fared miserably compared with the iPad. Additionally, Surface tablets will run the new Windows 8 touch-centric operating system and its acclaimed Metro interface, which is refreshingly different from what you can find on iOS or Android. While the Surface RT model will compete with other tablets, the Surface for Windows Pro will challenge the current crop of laptops and Ultrabooks–and it may well win. When Samsung introduced the Galaxy Note, some people thought it an ugly duckling for being too big a phone and too small a tablet. However, Samsung turned the oversize smartphone into a success with aggressive marketing, wide distribution, and good product design. Offering a 5.3-inch Super AMOLED display with a 1280-by-800-pixel resolution, the Note can serve as a smartphone or as a “smart notepad” on which users can write using its digital S Pen. This highly anticipated 7-inch tablet is poised to compete against Amazon’s Kindle Fire. Made by Asus, Google’s slate comes with a quad-core Nvidia Tegra 3 processor, an HD display with 1280-by-800-pixel resolution at 216 pixels per inch, a 12-core CPU, and a 4325 mAh battery that Google says should give you 9 hours of HD video playback on one charge. The tablet also sports near-field communication technology, as well as GPS, Wi-Fi, Bluetooth, and a 1.2-megapixel front-facing camera. 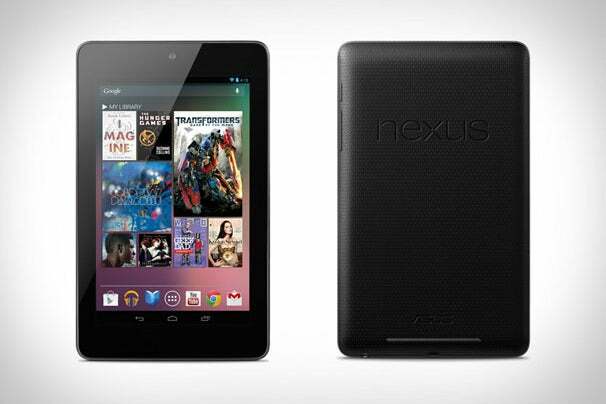 The Nexus 7 is simply the best 7-inch tablet you can buy today. According to Macworld, Apple’s MacBook Pro with Retina Display is a “groundbreaking release.” For starters, it’s 25 percent thinner than its predecessor. Even more impressive, critics have been thrilled by the laptop’s breathtaking display with its 2880-by-1880-pixel resolution. After you see this screen, others seem blurry in comparison; that’s because the human eye can’t discern the individual pixels, and you perceive no drop in contrast when you view the Retina display from different angles. The only issue anyone but Apple has with this power-packed laptop is its price. The basic model, with a 2.3GHz quad-core Intel Core i7 processor, 8GB of RAM, and 256GB of storage, starts at $2199. Vizio, the flat-panel TV maker known for its sleek designs and low prices, announced in January that it would enter the PC business. In June, Vizio made good on its promise and started taking orders for an Ultrabook, a laptop, and an all-in-one PC (shown here), each priced at $898. For more information, check out a roundup of all of the new Vizio products on our TechHive beta blog. Considering what Vizio has done in the TV market, its presence in the PC arena is good news for consumers seeking affordable computers with powerful entertainment features. The HTC One S is an ultrathin smartphone with an 8-megapixel camera that can capably fill in for a point-and-shoot camera. The handset also includes built-in Beats audio, so the handset is ideal for anyone who enjoys multimedia and games. Arguably the best phone on T-Mobile and one of the top Android phones overall among the four big carriers, the HTC One S boasts a premium design, employing a classic aluminum unibody shape that incorporates contrasting slate and blue-gray panels. In May, Google’s self-driving car passed its driver’s license test in Nevada, earning the first license of its kind in the United States. The self-driving car license clears the way for Google to test its technology on public roads in the state. Nevada says a number of other companies are looking to test self-driving cars on the state’s public roads. According to The Car Connection, you won’t be able to buy a fully autonomous car for at least a decade, but many self-driving elements–such as the parallel-parking-assist feature currently found on many luxury rides–will continue to be integrated into cars coming to market. This photo shows Google’s autonomous vehicle cruising in Nevada. Google’s new Jelly Bean operating system (Android 4.1) boasts improved performance, new notification features, better voice dictation and search, and an enhanced camera app. When PCWorld pitted a Galaxy Nexus using Jelly Bean against an iPhone 4S in a voice-search face-off, Jelly Bean came out ahead of Siri on 8 of 17 questions and commands. The lucky users of the Galaxy Nexus, the Nexus S, and the Motorola Xoom will get it in July, with the update already in process for all unlocked Samsung Galaxy Nexus phones. Be sure to read more about whether Jelly Bean will arrive on your phone. With Creative Suite 6–Adobe’s biggest revision in years–the company is bravely steering users away from its own Flash standard for Web multimedia. “Creative Suite 6 is full of technological triumphs, from the use of GPU acceleration in Photoshop CS6 and Premiere Pro CS6 to the ability of Dreamweaver CS6 to output smartphone apps for almost any mobile operating system by transferring their production to the cloud,” wrote PCWorld’s Alan Stafford in praise of Adobe’s Creative Suite 6. Since Google announced the mobile version of its Chrome browser for iOS in June, users generally have responded well. In June it was, for a time, the number one free app downloaded from iTunes. Until iOS 6 arrives with its tab cloud syncing, Chrome is a great bet for iOS users to sync their tabs, bookmarks, history, settings, and passwords across their Apple computers, tablets, and phones. Electronic-ink e-readers are great in that they’re lightweight, they hold a charge for a seeming eternity, and they’re easy to read even in sunlight. The only problem is, they need a light source when you want to use them in the dark. The Barnes & Noble Nook Simple Touch With GlowLight, however, includes a built-in light that doesn’t need any extra help, much to the delight of others around you, such as seatmates on a flight or bed partners who prefer darkness while they snooze. Samsung’s top-of-the-line UNES8000 Smart LED TV includes a “Micro Dimming Ultimate” feature that brightens the picture and reduces the halo effect often seen on edge-lit LED sets. The remote accepts voice and gesture controls, and the HDTV’s superthin bezel makes the screen seem almost edgeless. Your entertainment center would kill to host this beauty. Sony’s PlayStation Vita is an excellent handheld gaming machine that’s worth paying for if you demand more from your mobile gaming than smartphone or tablet games can provide. The PlayStation Vita packs a quad-core PowerVR Series 5XT SGX543MP4+ GPU that’s similar (though superior) to the dual-core SGX543MP2 GPU inside the Apple iPhone 4S and iPad 2. The GPU does a fantastic job of rendering movies and games without a hitch, and the Vita has respectable battery life. You’ll have to make some sacrifices in order to play with this kind of power, but if you’re willing to accommodate the Vita’s size–and Sony’s draconian memory-card pricing scheme–you’ll be rewarded with one of the most powerful handheld gaming devices ever made. Galaxy Tab 10.1 and Galaxy Nexus Banned in U.S. The ongoing patent war between Apple and Samsung recently saw a federal judge banning the sale of the Samsung Galaxy Tab 10.1 and the Galaxy Nexus smartphone in the United States. This decision wasn’t a win for consumers–and certainly not one for Samsung–but for Apple, it was huge. However, the injunction barring the sale of the handset was suspended in early July, and these days consumers are probably getting sick of Apple’s patent litigation. The federal bills known as the Stop Online Piracy Act (SOPA) and Protect IP Act (PIPA) would have allowed rights holders to seek court orders requiring payment providers, advertisers, and search engines to stop doing business with websites that infringe upon copyrighted material, so that search links to such sites would be removed. Neither piece of legislation did enough to protect against false accusations. They also would have given the U.S. government the power to censor the Web. After a mass protest by Web companies and millions of users on January 18, Congress postponed further action on the bills indefinitely. A full-HD display that uses IPS technology is the breakout feature of Asus’s new high-end Ultrabook. IPS produces a bright and clear image at all viewing angles, and offers terrific color. Amazon currently sells this Ultrabook for $1080 with an Intel Core i5-3317U 1.7GHz processor, a 128GB solid-state drive, a backlit keyboard, and the Windows 7 Home Premium 64-bit operating system.